Founded in 2008, the Peninsula Chapter of the Virginia Master Naturalist Program provides an opportunity for those who live on and around the Virginia Peninsula to become certified Virginia Master Naturalists and participate in local service projects designed to educate the public, maintain and manage local resources, and observe and report on the flora and fauna inhabiting the regional ecosystems. Now 10 years of service. 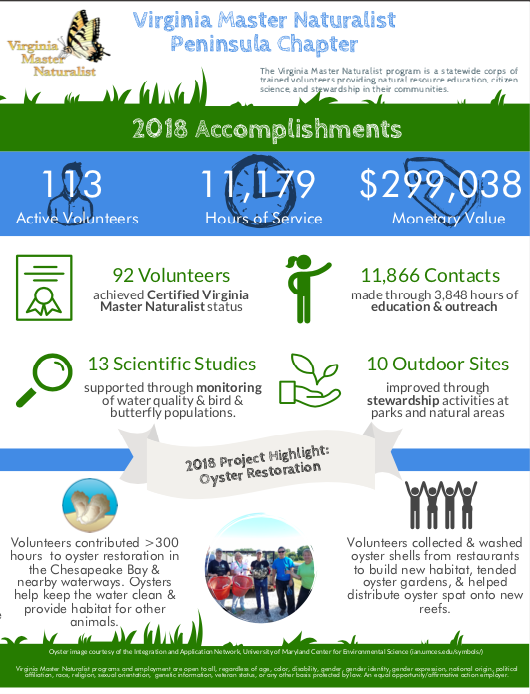 Your donation to Virginia Master Naturalist Peninsula Chapter is fully tax deductible and will directly support our environmental, volunteer projects on the Peninsula. Verifying our status as a charitable organization: Go to this IRS website: https://apps.irs.gov/app/eos/. Click on the button to the left of "Are eligible to receive tax-deductible charitable contributions." Input our Chapter's official name (Master Naturalists of the Virginia Peninsula) in the "Name" box, and click "Search." Thank you for your interest in the Peninsula Chapter of Virginia Master Naturalist volunteers. We are currently accepting applications for the 2019 Basic Training Course. The class size is limited to 20 participants, so do not miss out on this opportunity. There is a course fee of $150; please submit this payment with your application. Please note that the deadline for applications has been changed to February 9. Classes will be held primarily at Denbigh Community Center (15198 Warwick Blvd in Newport News) and the Virginia Living Museum (524 J. Clyde Morris Blvd in Newport News) from 6-9 pm on Wednesday evenings. In addition, field trips will be held around the Peninsula. 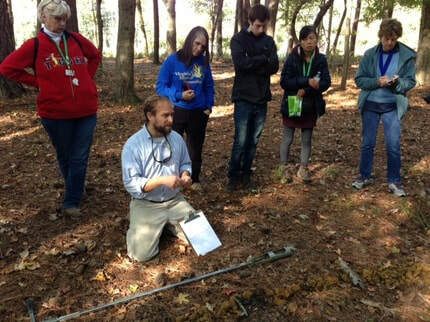 Topics covered in our course include, but are not limited to: Climate/Weather; Geology/Soils; Ecological Concepts; Botany; Dendrology; Entomology; Amphibians; Reptiles; Ichthyology; Ornithology; Mammalogy; Urban Ecosystems; Human-Wildlife Interactions; Marine/Estuary Science; Astronomy. The goal of our class is to give trainees a good grounding in basic environmental topics and leave them knowing how to find more information about each topic. This results in knowledgeable volunteers for our public lands. Certified members are required to annually contribute 40 hours of volunteer service and 8 hours of continuing education. To become a successful graduate of our Basic Training, you should have access to email, understand how to find information using a web browser, and have the ability to open PDF files. Most of our coursework readings are online, and most of our out-of-class communication is via e-mail. If you are a person with a disability and desire any assistive devices, services or other accommodations to participate in this activity, please contact Megan Tierney at 757-890-4940/*TDD during business hours of 8 a.m. and 5 p.m. to discuss accommodations 5 days prior to the event. *TDD number is (757) 890-3300. Click image below to download application form. Please note, deadline for applications has been extended to February 9.